With the new football season now in full swing and shirt personalisation a key service at Kitbag.com, here is a look at this year’s ten most popular player names chosen by their customers for their shirt orders. 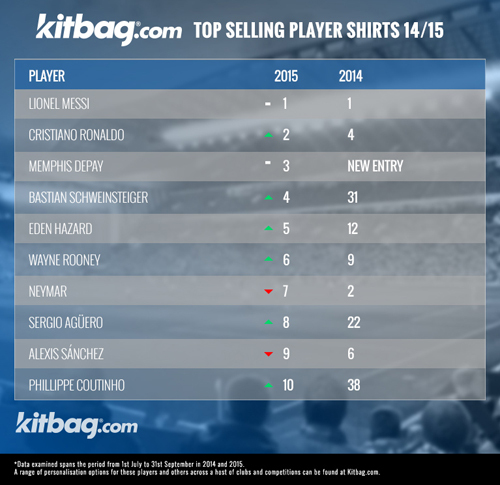 From established figures to new sensations, the top ten shows the enduring popularity of Premier League and La Liga stars; but who will be crowned the king of the custom shirts for 2015? Sales of Phillippe Coutinho shirts have skyrocketed by 440% over the past 12 months, as the expectation of Liverpool fans falls at his feet following the departures of standouts Steven Gerrard, Raheem Sterling and Mario Balotelli. While fans at Anfield await the changes brought by a new manager, the Brazil international is expected to feature prominently in any plans. Arsenal’s second most-expensive signing ever, fans of the Gunners appear to be banking on Alexis, with the Chilean another on the list on the rise. Failing to deliver the elusive Premier league title that the Londoners so crave, Alexis would help the Emirates Stadium outfit capture the FA Cup and Community Shield in 2015, retaining his berth in our personalisation top ten in the process. Though his club may have failed to secure silverware over the past year, Manchester City’s player of the season Sergio Agüero remains a hugely-popular figure at The Etihad; bolstered by scoring his 100th goal for the club. Following a Premier League campaign that saw the Argentinian net 29 times in 33 appearances, Agüero climbs 14 positions to sit comfortably inside our top ten rankings. Slipping ever-so slightly in the wake of Brazil’s dismal exit to their own World Cup, Neymar’s goals that helped Barcelona to another Spanish championship have helped keep his stock high with personalisation enthusiasts. Second in last year’s rankings, Neymar is one of only three non-Premier League players in our top ten; sitting in the lofty company of Messrs Messi and Ronaldo. In spite of an influx of new and exciting signings for his club side, striker Wayne Rooney remains a strong performer with Manchester United and England devotees. The striker, who received much coverage for his high-profile pursuit and toppling of Sir Bobby Charlton’s international goal-scoring record, is the strongest-performing Brit in the list and another climber, moving up three places. Part of a dynamic Belgian squad that soared to second in the Fifa World Rankings and a Chelsea team who reclaimed the Premier League title, Eden Hazard would climb this table also in 2015, landing inside the top five after a 12th-place finish a year ago. With his best years still to come, the popularity of this winger with the world at his feet looks set to only grow as his career continues to blossom. Up 27 places and a staggering 795% from the World Cup year that preceded, German international Bastian Schweinsteiger is proving a highly-popular option with Manchester United fans, tearing past teammate Wayne Rooney in our player personalisation rankings. With a successful debut season at Old Trafford, even more Reds could be racing to get his 14 letters printed in the months to come. Third most popular in our rundown and this year’s highest new entry, Memphis Depay has seized the imagination of Manchester United aficionados, leaving many supporters walking in Memphis shirts as the new football season began. Expectation from the Old Trafford faithful is relentlessly high, but can the young Dutchman deliver? Many have already put their shirt on him. With sales increasing 108%, Ballon d’Or winner Cristiano Ronaldo has shot up from fourth position a year ago to second this time around, with the Portuguese superstar now nipping at Lionel Messi’s heels. In the aftermath of his record-breaking exploits of late, it is expected this trend will continue; with the goalscoring machine of Madrid a real threat to Messi’s customisation crown for 2016. A full decade after breaking through at the Nou Camp, Barcelona’s Lionel Messi retains his spot as the most popular player in our shirt personalisation countdown. Sales of Messi-themed merchandise have not reached the dizzying heights of the previous year (when his native Argentina reached the World Cup Final), but remain formidable enough to keep a host of world class competition at bay. The biggest percentage leap of anyone in the list, Pedro (Chelsea/Spain) recorded a stunning 1460% increase from last year, as Chelsea fans expect their August 2015 signing from Barcelona to be a star man at Stamford Bridge this season. The Spaniard is one of three Chelsea newcomers to surge over 1000% in sales, joining teammate Kurt Zouma (Chelsea/France) and a rare goalkeeper on the list, Thibaut Courtois (Chelsea/Belgium). While his move from Anfield to the Etihad Stadium was at times steeped in controversy, Raheem Sterling (Manchester City/England) has retained his popularity; selling a similar amount of personalised kit in the colours of Manchester City as he did in those of Liverpool. In the South meanwhile, Diego Costa (Chelsea/Spain) remains a strong and stable performer; one of only two players in the Top 50 to record 0% movement and surpassing the other, Jack Wilshere (Arsenal/England), significantly. Despite performing to a higher standard on the pitch this season, sales of Juan Mata (Manchester United/Spain) kit have been down almost 50% as United supporters opt to back new signings Memphis and Schweinsteiger instead. The biggest drop however has been for former teammate Angel Di Maria (Paris Saint-Germain/Argentina), who plummets from third all the way to the dizzy depths of 100th following his 2015 exit from Old Trafford. Another departure, Radamel Falcao (Chelsea/Colombia) has enjoyed 94% less success since his switch to Stamford Bridge, suggesting Chelsea fans bear less expectation for their new striker after his torrid loan spell at Old Trafford.